The beer is a 12% Saison, conceived initially by Jason at Trinity and added to and changed by many other brewers. Rockyard Brewing in Castle Rock provided the brewing space, fermentation space, checked in on the beer, and is handling the distribution. The malt bill of the beer consists of a complex blend Weyerman Pilsen, Vienna, Rye, and spelt for a golden color yet vinous body. Pumpkin was added in the boil for the smooth textures dancing over the palate. Several varieties of whole peppercorns were added to the boil to further reinforce the expected spiciness of this Saison. 5 distinct yeasts creating a spicy and fruity ester profile. 3 of the yeasts were provided by Troy at AC Golden. Post fermentation the batch aged on American Oak Chardonnay barrels, 6 varieties of Bretta, and the rare fruit known as Buddha’s Hand. Buddha’s hand was also in the boil. We had sampled the un-aged version of the beer at the Saison Fest earlier this year and it seemed quite promising. The oak barrels were provided by Chad Yakobson of Crooked Stave. Earlier in the week he and Jim Stinson mixed the beer from the barrels and prepped it for the bottles. The bottles were pre-labeled by some very appreciated folks at Rockyard. Before we began the work, we toasted the collaborative efforts of all the various breweries involved and to the brewer’s guild. I’m not going to give away any secrets on how the beer tasted until it’s available to the public, but it’s pretty exciting. I will say that it will be a good beer to cellar for a couple years. We filled somewhere around 1700 bottles. Here’s Gordon of Funkwerks bringing the capped bottles over to the station where the government warning stickers are applied. Gordon also hauled his bottling line all the way down from Ft. Collins that day. Thanks to him the day moved hours faster than it would have. My job all day was applying the government labels, when I wasn’t taking pictures. When I finished applying the sticker I sent the bottles over to Rikelle, Trinity bartender extraordinaire. The bottles will come with a few different waxed tops, including orange, red, blue, and green. The wax comes from crayons at the Rockyard restaurant. Any time some little kid broke a crayon it went into a special bag and was collected for this purpose. 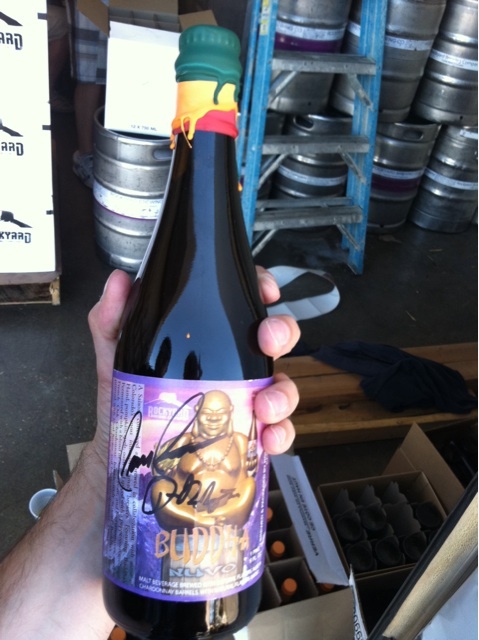 Finally each bottle is signed by Jim and Jason, they’re hands weren’t even tired by the end of the day. So the beer is currently bottle conditioning, but should be available to the public starting on July 22nd. I know that Rockyard and Trinity will be selling some. I’m not currently sure all the places you’ll be able to find this beer, but I imagine it could become available at your local beer shop. Give your local store a call and tell them you want this beer. The beer is going to be spendy, we’re looking at somewhere around $40 per bottle, but there’s a lot that’s gone into the beer and also some of the profits will be going to the Colorado Brewer’s Guild in order to fund better ‘beer education’ for important topics such as next year’s grocery store beer bill. I’ll keep you all posted on how the beer tastes. I’ll crack open a bottle when it becomes available, and I’ll let you know if there are any Buddha Nuvo parties, etc.